By Christopher MaupinUniversity of Texas Institute for Geophysics, Austin, Texas. July 1st 2010, 4PM. Double check, triple check, quadruple check. Fold geologic maps. Cram everything you can fit into giant dry bags. Scam an airline into letting us board with two dry bags, all our personal gear, and multiple footlockers, and a giant yellow container resembling a buoy from a shipping lane, which actually contains a GPS antenna. This doesn’t include the gasoline powered chainsaw engines and water pumps we have already shipped to Port Vila on the island of Efate. Sacrifice a live chicken to make sure said items get checked all the way through to Vanuatu. Maybe a goat, too… you get the idea. I’m a Ph.D. candidate in paleoclimatology. That means I’m basically a chemist who studies stable isotopes. And an oceanographer that studies tropical climate. There’s some biology in there for good measure. So how in the hell did a nerd like me end up on headed to Vanuatu? The short answer: samples. The tropical west Pacific holds the Earth’s largest oceanic warm pool, or region of water with annual average surface temperature greater than 28C [Cravatte, et al., 2009]. This region supplies heat and moisture to the entire planet and is home to the most intense form of year-to-year climate change on the planet– the El Niño-Southern Oscillation [Clement, et al., 1999]. So you should have the impression that climate change on any timescale in this region is tremendously important to the livelihood of millions and millions of humans. It would be a good thing for us to know how it has varied in the past, so we can know how it might change in the future. The problem with this is that humans have only been keeping climate records for the blink of an eye: about 150 years or so, and in places like the tropical west Pacific, the time span of reliable records may be considerably shorter. Luckily, in the 1950’s, a brilliant chemist named Harold Urey figured out that using fundamental thermodynamics, the ratio of two different stable isotopes of oxygen (oxygen atoms with different numbers of neutrons) incorporated into the CaCO3 tests and skeletons of marine organisms would be dependent on the temperature at which the test or skeleton was formed. 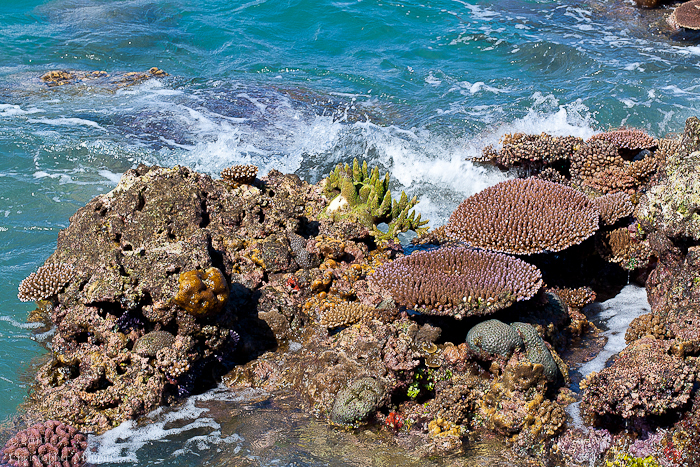 Massive corals provide a nearly ideal recorder with which to study year-to-year variability in the tropics. They can live as long as a thousand years, can contain annual density band couplets like tree rings, and grow at a rate at which we can analyze their skeletons continuously at monthly resolution for changes in oxygen isotope ratios [Watanabe, et al., 2003; Correge, 2006]. In other words, we can generate a monthly, proxy-based record of climate variability hundreds of years in length by coring a large living head of Porites orDiploastrea. You can find many examples of such datasets available on the NOAA paleoclimate database1. But what happens when you are interested in climate change from earlier than the last thousand years? 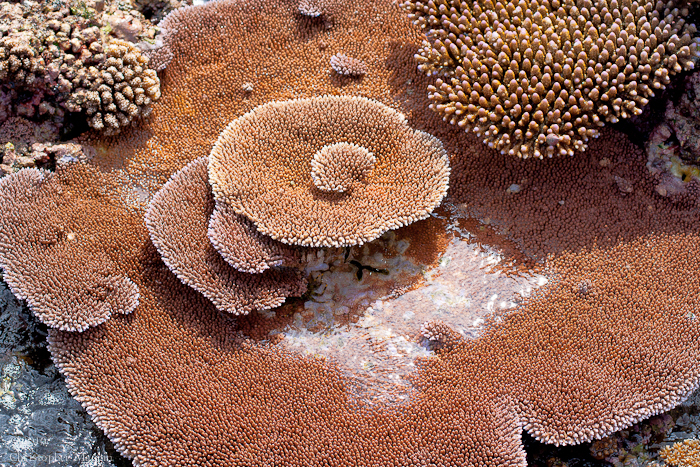 You have to look for where, somehow, older coral colonies have been preserved in an identifiable fashion. Enter plate tectonics and the leeward coast of Malakula. If memory serves, the flight to Los Angeles from Austin takes about 4 hours. Then we board an Air Pacific flight from L.A. to Nadi, Fiji. Eighteen hours later, we land in Nadi, before dawn. As we watch the sunrise, remarkably European boutique stores begin to open up, we watch World Cup matches while drinking awful cappuccinos. Finally, we board our two-hour flight for the city of Port Vila on the island of Efate in the nation of Vanuatu. We settle in for a few days in a rented apartment while we get our ducks in a row and work with the amazing folks at Geohazards, who received our shipment of equipment. After five days in Vila, we hop on a ship for passage to Luganville on Espiritu Santo, which takes a day, then we sail to Malua Bay on the northwest edge of Malakula island. At this point we have nearly a dozen pieces of luggage and an outboard motor in tow. The northwestern coast of Malakula uplifts at a rate of one to several millimeters per year depending on which village you’re in. Beaches are limited to outlets of streams and creeks, the rest of the island’s periphery is a series of coral cliff terraces which encompass the last 10,000 years of coastal coral growth. The level closest to the water at high tide is 1-2 meters above sea level, and is pocked with holes and surge channels. It’s hard to put into words what these cliffs actually look like, but phrases like “meat grinder” and “bone crusher” and “the dentist’s office” seem remarkably apropos. Hiking on these cliffs demands full concentration. One slip or poorly estimated jump over a surge channel and… if you’re lucky enough to break your legs before the one flight from the Norsup airstrip on the opposite coast of the island with enough time to spare to actually get you over the mountains in a truck you hired from the village, then it may take 24 hours to be in the care of the hospital in Luganville. So then why in the hell are we hopping around on these cliffs? The goal is to identify fossil colonies of either Porites or Diploastrea that are large in size, of appropriate age, still in growth position, and were exposed to open water when they were living. Then, you hike back to the beach, retrieve two footlockers, one of which contains a chainsaw modified to hold a diamond-tipped coring barrel and a water pump to cool the coring barrel. The second footlocker contains tools, the coring barrels, extension rods, breaker bars and hoses. Sometimes the lockers can be canoed to the drill site in village outrigger canoes. Sometimes you have to hike the same surge channels with a fully assembled chainsaw engine and core barrel across your back. Village life is very much alive on Malakula, and I had the great honor and privilege of meeting a 91-year old high chief of the Big Nambas tribe, Chief John Peter, a man who could vividly describe to us tsunamis and uplift events. He could tell us where the beaches and waterlines and canoe landings had been through time. He waxed philosophical that the government should be for the city alone, and that the tribal system is better for the people. He lamented the loss of reverence by children for tribal and village life on Malakula. His son-in-law, Chief Ruben of Espiegle Bay, a man incredibly gifted in the art of hospitality, made us feel at home and was a quick study in the drilling operation. He was always at our side with a crew of young villagers helping us with even the most mundane and minute details of our work. He invited us to drink potent Vanuatu kava with yet another chief in the village of Tenmaru– a gesture for which it is considered a great honor for guests to receive. The people of this nation, who carry the demonym of Ni-Vanuatu, are Melanesians, and absolutely the friendliest people that I personally have ever encountered. They exude a happiness and genuine absence of malice that borders on the surreal. Another thing you notice about the Ni-Vanuatu is their language, Bislama… for some reason, no, it can’t be, wait… did I just sort of understand a language I have never heard, originating from the other side of the world? The answer is probably a qualified yes. Bislama, the national language, is a formalized form of pidgin English, developed in the mid-nineteenth century and distributed when survivors of an indentured servitude on plantations in Australia and Fiji began returning to the New Hebrides archipelago. Each day during our routine endeavors, the tide is going down. 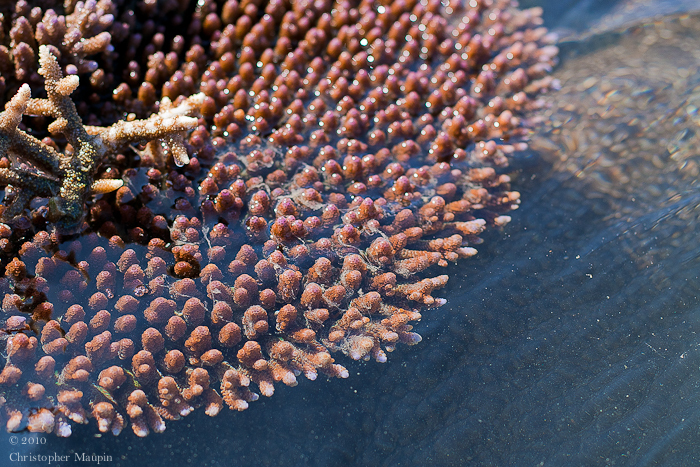 During the austral winter, the “low” low tide occurs during approximately midday. As the waterline traverses down through surge channels out through actively uplifting reef hardbottom, a theatrical reveal leaves you breathless. 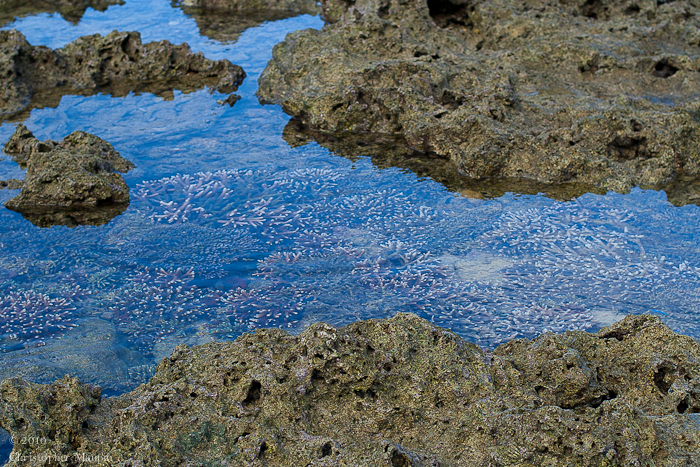 A colorful explosion of innumerable live corals perched precariously on thousand-year old dead corals form tidepools, trapping a dizzying array of small reef fish, crinoids, eels, sea snakes, mantis shrimp and mollusks. 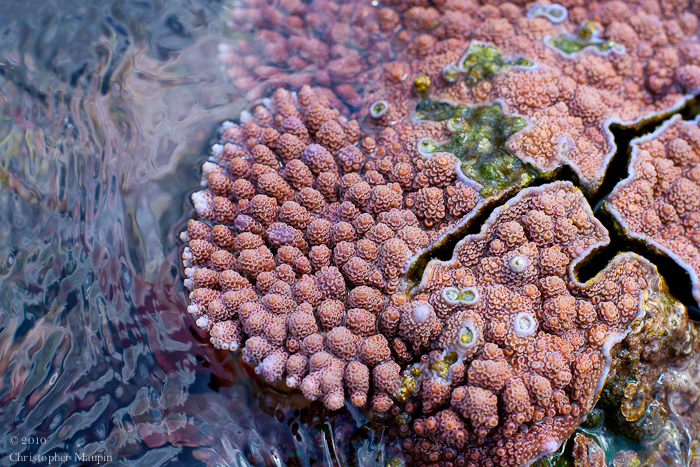 Some of the corals can remain exposed for 4-5 hours at the upper edge of their survival margin, and at such rapid uplift rates, will be dead within a decade, replaced by the corals that are, for now, below them. As they say ” one photo speaks a thousand words, ” so I’m going to let the photos do the rest of the talking. Enjoy.